Billed as the Bundesliga’s Topspiel on Saturday night, Gladbach vs RB Leipzig should have been an action-packed affair. In truth it was a game with little overall quality, eventually decided by second half substitute Ademola Lookman. The Everton loanee came off the bench and guided a beautiful shot into the far corner of the goal, giving Gladbach stand-in ‘keeper Tobias Sippel no chance. 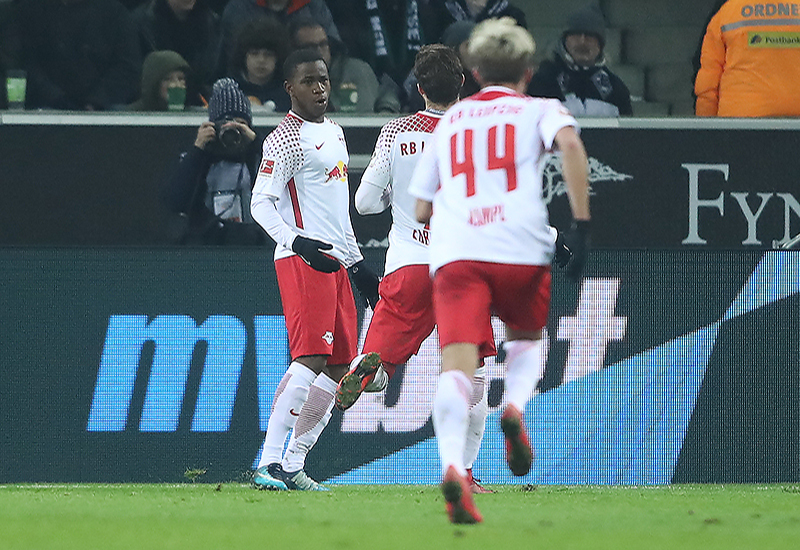 Ademola Lookman becomes the first English player to score in the Bundesliga since Owen Hargreaves back in 2005, when he also scored against Mönchengladbach. With both teams fighting for a top four placing, Saturday evening’s fixture was full of expectation. Unfortunately, it became quickly evident that only one team had setup to attack. Dieter Hecking’s side were happy to allow their visitors the freedom to pass the ball around – the hosts opting for a counter, if and when the situation presented itself. Following a similar path to Gladbach’s performance away to Frankfurt last week, their play was peppered with long ball clearances and a hope Lars Stindl could get on the end of a defensive clearance. It was though Leipzig who broke through the backline of a defence first – Zakaria tried to twist and turn inside the Roten Bullen box, stopped short the ball fell to Naby Keita who tried a quick over the top ball to Werner. The German striker was a little slow in his reaction and in doing so was just unable to reach the pass. Minutes later and it was the hosts turn to try their luck on a fast break – Hazard drove towards the goal, unleashing a shot just inside the Leipzig area. It was an excellent fast break that deserved a better finish. 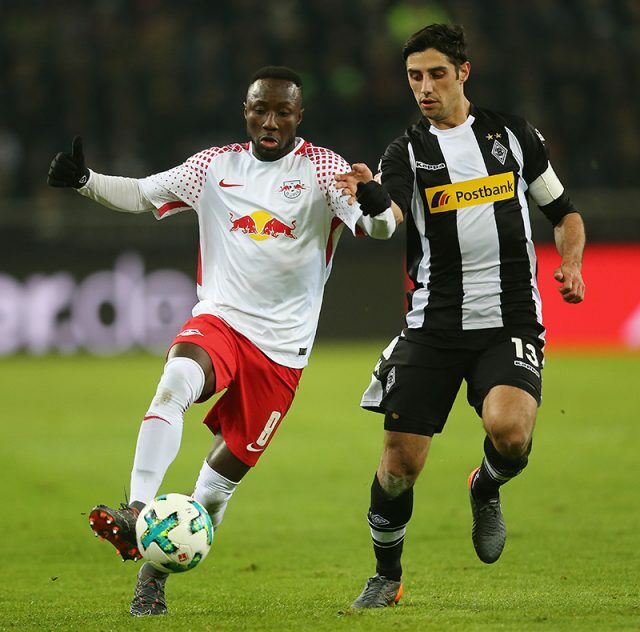 As the half wore on the most interesting battle began to unfurl – Gladbach captain, Lars Stindl began to take his frustrations out on Leipzig’s Naby Keita. Collecting a yellow card on 17 minutes the striker then went on to nibble at the Guinean a further three times. As the referee blew the whistle for half time those inside Borussia-Park had witnessed 45 minutes of drab unimaginative football. Ralph Hasenhüttl will have undoubtedly seen how Frankfurt approached the second half of their fixture versus Gladbach last week, firing his players up at half time he would have known how crucial a quick start was. The side in red and white came out instantly looking to break the deadlock, inside the first second half minute Sabitzer played a delightful ball from the edge of the Gladbach box, Naby Keita caught the cross on the half volley but hit it straight into Sippel’s grateful hands, it was a lightening start to the second half by Die Roten Bullen. The early scare seemed to coax Gladbach into life. Moments later they had two clear opportunities within a few to seconds to grab the opening goal – Herrmann found space in the area but was unable to take advantage of a one-versus-one situation against Gulacsi, the Hungarian made a tremendous block but was powerless to stop the rebound falling to Stindl. The Gladbach captain opted to try and side foot the ball into the net from four yards, the chance was stopped on the line – had he gone for power the goal was almost certain. It was a poor decision from the forward, one that typified his evening. 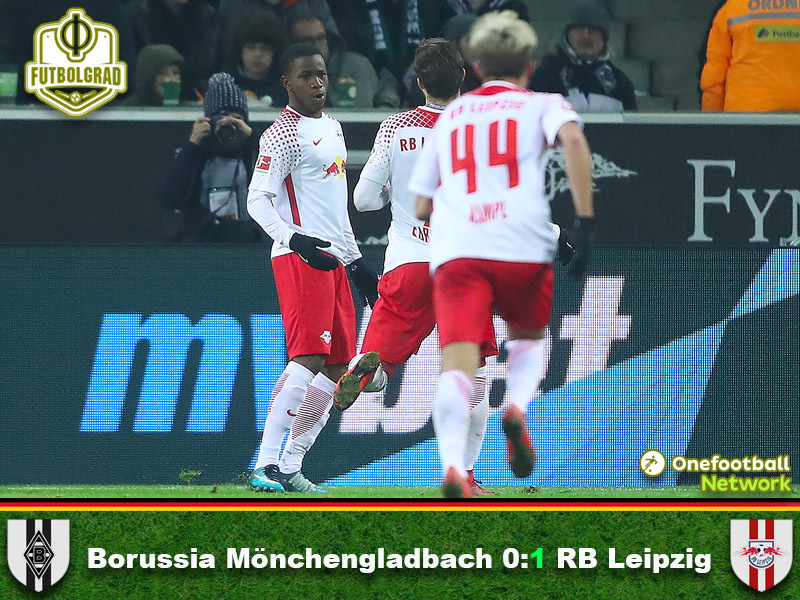 Leipzig then had two of their own chances to take the lead but Sippel in the Gladbach goal was equal to them, the stand-in goalkeeper pulling off two excellent saves in quick succession. On 79 minutes Leipzig made a substitution, off went Bruma – the Portuguese winger replaced by Everton loanee, Ademola Lookman. The Englishman joined Leipzig on transfer deadline day and he would go on to have the final say in this fixture. Ten minutes into his debut the 20-year-old Londoner picked up the ball midway inside the Gladbach half, with little by the way of options along side him he drove at the host’s defence – reaching the edge of the area he unleashed a shot from an acute angle that Sippel could not reach. As the ball nestled inside the far post the Leipzig bench went wild. Hasenhüttl running 40 yards to celebrate the last minute winner with his new signing. In a game with little overall quality it was the desire and determination of Leipzig’s young Englishman that changed the game. Unfazed by new surroundings and unfamiliar teammates, he showed composure beyond his years to single handily turn the fixture from a certain goalless draw into three points for the side from Saxony. Lookman’s daring run ended with the forward placing the ball in the only place Sippel couldn’t reach, it was a finish worthy of winning any game. As the youngster wheeled away in celebration he became the first English player to score in the Bundesliga since Owen Hargreaves back in 2005. The hosts were whistled and jeered as they left the field at Borussia-Park. Dieter Hecking’s side showed a lack of creativity and ambition for large parts of this fixture. When they finally got into a position of threat it was Patrick Herrmann who first wasted an excellent chance – firing the ball straight at the outrushing Gulacsi. The follow-up fell to captain Lars Stindl, who inexplicably opted to try and place the ball into the net when only power would have beaten the recovering defence. Gladbach were not only toothless in front of goal they were unimaginative on their approach to breaking the deadlock en route to it. Back to back defeats unsurprising then for a side who look way short of form. Gladbach end Matchday 21 in seventh place, outside the European placings. Leipzig’s victory takes them to second in the table.